Choosing the right school for your children is something that requires a lot of thought and deliberation. Admitting a child in an international school like Manchester is very advantageous for parents as it brings children among diverse enrolment of many nationalities, and celebration of different cultures, creating a welcoming environment in which students can settle in and make friends. Another advantage for parents here is the rolling admissions policy that we have. 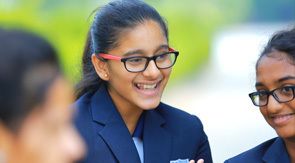 At Manchester International School, admission is on a rolling basis so students can join throughout the year. Parents also get the advantage to see the child develop his/her language skills in an exceptional way. We always give preference to spoken and written English as English is the language of instruction. English language support is also thoroughly provided for students for whom it is not the first language. For boarders, we aim to provide emotional and moral Support throughout the school year to help them settle into a new community. Due to this support parents feel safe and secured in leaving their children with us. Our National and International curricula (CBSE, IGCSE, AS & A Levels, IB PYP & DP ) provide students with a high quality education that will stand them in good stead whether they return home, move on to a new country, or stay in India. This assurance can leave the parents with a relaxed peace of mind. We also ensure to give career guidance and counseling for your child to seek admission into a good university of his choice and select the best course suited to them. Manchester International School is awarded as one of the best schools in coimbatore, the best school in Tamil Nadu and the best school in India by Education World, Education today and by many organisations constently. Finally, it’s been proven repeatedly that learning in an international school opens doors for its students. Studies have shown that children from international schools are more likely to attend college and university and their international education puts fewer limits and restrictions on them.